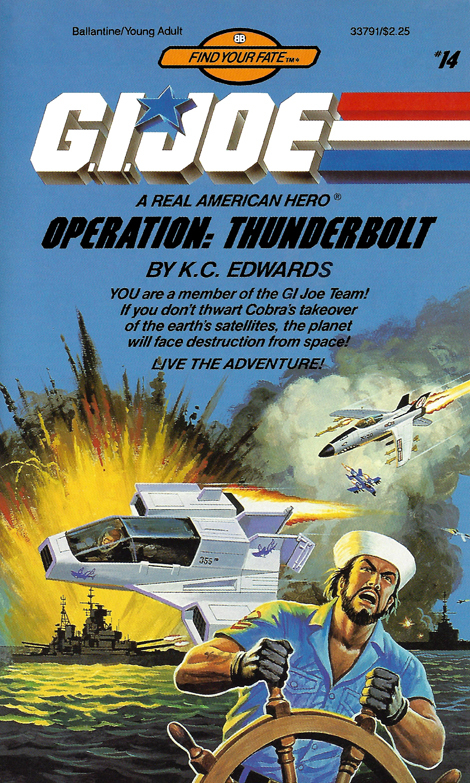 Operation Thunderbolt is yet another in the Find Your Sate series, a Choose Your Own Adventure uh…homage (AKA rip-off) that casts the reader in the midst of the GI Joe team. In this episode, the irascible Shipwreck is apparently piloting the helm of a ship, because the rest of the vehicle is nowhere to be seen according to the cover painting. Kidding aside, the rendering of the character and the SHARC is quite well done. I had this one & the one with Roadblock in the snow on the cover as a kid – hours of fun???? It’s interesting how closely the artist referenced the SHARC boxart, but the graphic is pretty different. Kinda funny to see the directional vanes splaying apart. But the massive explosion background gives this a real sense of action! If I hadn’t read some of these books before with their simplistic style, I’d be tempted to pick it up. I like to think Shipwreck is in some kind of nautical museum, flashing back to this big battles where he was at the helm of the U.S.S. Flagg, just like he was on the Flagg box art! But maybe I just look at this stuff too much. One of those ships looks like the Bismark. I think he’s either having a flashback to WW2 or he got drunk whilst listening to Johnny Hortons greatest hits.